JFreeChart is open source or, more specifically, free software. It is distributed under the terms of the GNU Lesser General Public Licence (LGPL), which permits use in proprietary applications. For a closer look at JFreeChart, please try the extensive demo application included in the download or browse the Samples page. JFreeChart 1.5.0 is now available. This release includes a streamlined build structure with JavaFX support being moved into a separate project (JFreeChart-FX). JFreeChart 1.0.19 is now available. This is mostly a maintenance release for the recently added JavaFX support. JFreeChart 1.0.18 is now available and features a JavaFX ChartViewer control and numerous other enhancements. We are pleased to announce the availability of JFreeChart 1.0.17. We are pleased to announce the availability of JFreeChart 1.0.16. 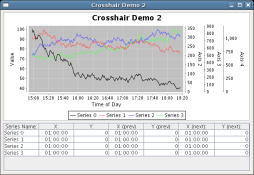 JFreeChart 1.0.15 has been posted to the download page at SourceForge. The JFreeChart project was founded fourteen years ago, in February 2000, by David Gilbert. Today, JFreeChart is the most widely used chart library for Java (see a list of some of the products and projects that use JFreeChart), with more than 2.2 million downloads to date. The project continues to be managed by David Gilbert, with contributions from a diverse community of developers. If you are interested in contributing to the project, please see the JFreeChart project page at GitHub. Funding for the project is provided by Object Refinery Limited, a private limited liability company based in the United Kingdom. Object Refinery sells documentation for JFreeChart, a 3D chart library for Java (Orson Charts) and a PDF generator for Java 2D (Orson PDF). JFreeChart requires JDK version 1.6.0 or later). Note that JFreeChart is a class library for use by developers, not an end user application.